On 7 August 1915, in an ill-fated attempt to break the stalemate at Gallipoli, hundreds of Australian light horsemen repeatedly charged the massed rifles and machine-guns of the Turkish soldiers. The charge at The Nek has been immortalized in art, literature and film and has come to epitomize both the futility and courage of the Gallipoli campaign. 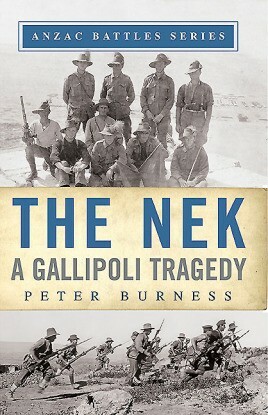 In this classic book, Peter Burness provides the best account ever published of the formation and training of the Light Horse regiments (including profiles of the officers involved), the battle itself and a careful consideration of how the suicidal charges were allowed to continue when any hope of success was lost. For this new edition, the author has updated the text to include new information that has come to light since the book was first published in 1996, and he has also provided new maps and photographs. Peter Burness is a Senior Historian at the Australian War Memorial in Canberra and the Memorial’s longest serving employee. A specialist in the battles of World War One, he has written several books on the subject, and has also worked on numerous permanent, temporary and travelling exhibitions. A long-serving member of the Armed Services working group of the Australian Dictionary of Biography, he has contributed over 20 entries to the dictionary. Since 1994 he has led the Memorial’s annual tours to the Western Front.